The Sun Sentinel of South Florida won the Pulitzer Prize for public service on Monday for its coverage of the deadly shooting at Marjory Stoneman Douglas High School in Parkland, Fla., a tragedy that unfolded just miles from the paper’s newsroom. Reporters spent months documenting the shooting and its aftermath in their community and its affect on the national debate over gun rights. In a harrowing reconstruction, The Sun Sentinel revealed a series of failures by local officials and law enforcement that, the paper wrote, cost children their lives. This is the second time that The Sun Sentinel has received the public service award, considered the most prestigious of the Pulitzers. The paper, based in Deerfield Beach, Fla., north of Fort Lauderdale, won the category in 2013 for its investigation of the speeding habits of local police officers, who were later disciplined. 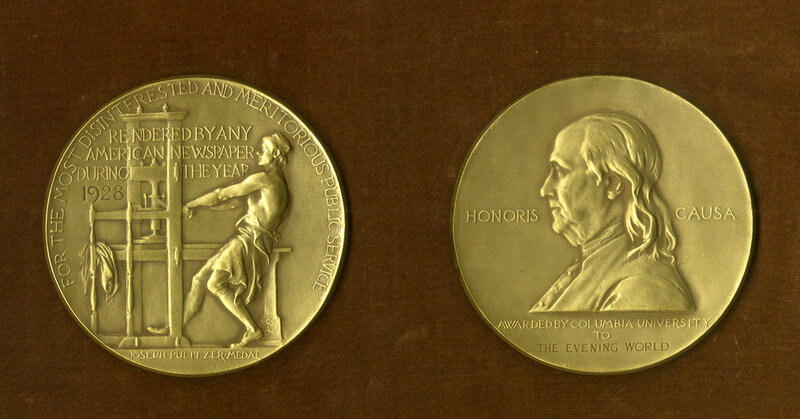 In honoring a smaller newspaper, the Pulitzer board recognized the importance of local journalism at a moment when regional papers are struggling to survive. The awards, first handed out in 1917, are presented annually by Columbia University for excellence in journalism and letters. The New York Times received the explanatory reporting prize for a forensic review of President Trump’s family finances, which uncovered a series of dubious schemes — including instances of outright fraud — that allowed the future president and his relatives to avoid paying hundreds of millions of dollars in taxes. The investigation, by the Times journalists David Barstow, Susanne Craig and Russ Buettner, drew on tens of thousands of pages of confidential records and lasted 18 months. Mr. Trump’s financial irregularities were the focus of a prizewinning report by The Wall Street Journal, which revealed how the president’s lawyer, Michael D. Cohen, arranged hush-money payments to the adult film actress Stormy Daniels in the run-up to the 2016 election. The Journal won the award in the category of national reporting. The Times also won the prize for editorial writing, for essays by Brent Staples, who has been a member of the paper’s editorial board since 1990. Mr. Staples’ editorials and essays are included in dozens of college readers throughout the United States and abroad. Before joining the editorial page, he served as an editor of The New York Times Book Review and an assistant editor for metropolitan news. His essay on Sugar Land, Tex., has had significant impact on how people in the state saw the city’s plan for relocating the recently discovered skeletons of men and women who were worked to death on sugar plantations in the late 19th and early 20th centuries. The essay galvanized protesters in the state who wanted the skeletons memorialized in place. A month after the essay ran, a state court stopped the city from moving the remains and appointed a lawyer to oversee the disposition of the remains. The case is now before an appeals court. An editorial on suffrage also had a wide impact, leading supporters of a planned women’s suffrage memorial in New York City’s Central Park to withdraw that support and to debate how to fairly memorialize a 19th-century movement that was actually quite diverse. Women who knew little or nothing of this diverse history before the essay have called for revising the memorial to more adequately reflect history. This is a developing story and will be updated. Previous PostPrevious France and Belgium Refuse Support for New Trade Talks With the U.S.